Joseph Ratzinger (Pope Benedict XVI) was born on 16 April 1927 in Marktl am Inn, Germany. His father, a police officer, came from a traditional family of farmers from Lower Bavaria. He spent his adolescent years in Traunstein, a small town on the Austrian border. 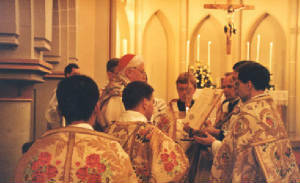 It was in this context, which Pope Benedict XVI himself has described as "Mozartian", that he received his Christian, human and cultural formation. Joseph's days of youth were far from easy. His faith and family upbringing prepared him for the harsh experience of the problems connected with the Nazi regime; he even remembers seeing his parish priest being beaten by Nazis before celebrating Holy Mass, and was well aware of the fiercely hostile atmosphere to the Catholic Church that existed in Germany at the time. Towards the end of World War II, Joseph was enrolled in the auxiliary anti-aircraft service. From 1946 to 1951, he studied philosophy and theology at the University of Munich and at the higher school in Freising. Together with his brother Georg, he was ordained a priest on 29 June 1951 in the Cathedral at Freising. In 1953 Fr Ratzinger obtained a doctorate in theology with a thesis entitled: "The People and House of God in St Augustine's doctrine of the Church." Four years later, he qualified as a university professor. He then taught dogma and fundamental theology at the higher school of philosophy and theology of Freising; then in Bonn from 1959 to 1969; in Münster from 1963 to 1966; and in Tübingen from 1966 to 1969. Beginning in 1969, he was a professor of dogmatic theology and of the history of dogma at the University of Regensburg, where he eventually became Dean and Vice-Rector. From 1962 to 1965 he was present during all four sessions of the Second Vatican Council as a chief theological advisor to the Archbishop of Cologne, Cardinal Josef Frings. Fr Ratzinger's important and useful experience as a priest and an "expert" at the Second Vatican Council was immensely valuable and fundamental to his life. He lived out this experience as confirmation of his own vocation, which he defined as "theological". The rapid succession of his numerous, detailed publications has also continued as the years have passed, serving as a reference point for Catholics and especially for those involved in advanced theological studies. "Fellow Worker in the Truth"
On 24 March 1977, Pope Paul VI appointed him Archbishop of München und Freising (Munich and Freising). He was ordained a Bishop on 28 May that same year and was the first diocesan priest in 80 years to take on the pastoral governance of this large Bavarian Diocese. He chose as his episcopal motto: "Fellow Worker in the Truth" (cf. III Jn 1: 8). He was created and proclaimed Cardinal by Pope Paul VI in the Consistory of 27 June 1977, of the Titles of the Suburbicarian Church of Velletri-Segni (5 April 1993) and Suburbicarian Church of Ostia (30 November 2002). On 25 November 1981 he was appointed by Pope John Paul II as Prefect of the Congregation for the Doctrine of the Faith. He also became President of the Biblical Commission and of the Pontifical International Theological Commission. On 15 February 1982, he resigned his pastoral office as Archbishop of Munich and Freising. "Catechism of the Catholic Church"
His role as President of the Commission for Drafting the Catechism of the Catholic Church and the six years of intense work (1986-92) behind its preparation are one of his many outstanding achievements. On 6 November 1998, he was appointed Vice-Dean of the College of Cardinals; on 30 November 2002, the Holy Father approved his election, by the order of Cardinal Bishops, as Dean of the College of Cardinals. Until his election to the Chair of Peter Cardinal Ratzinger was a Member of the Council of the Second Section of the Secretariat of State; of the Congregations: for the Oriental Churches, for Divine Worship and the Discipline of the Sacraments, for Bishops, for the Evangelization of Peoples, for Catholic Education, as well as for the Pontifical Council for Promoting Christian Unity and of the Pontifical Commission for Latin America and the Pontifical Commission Ecclesia Dei. As Dean of the College of Cardinals he presided over the College's deliberations during the Vacancy of the Holy See following the death of Pope John Paul II on 2 April 2005. 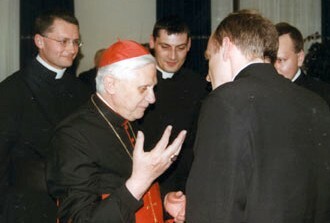 On Friday, 8 April, Cardinal Ratzinger presided at Holy Mass in St Peter's Square for the funeral of Pope John Paul II. 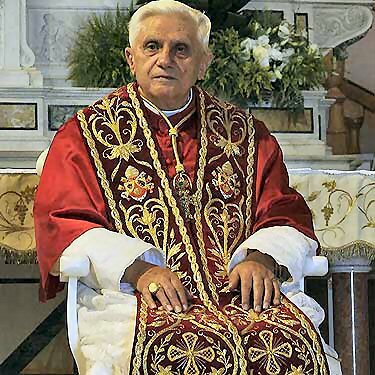 On Tuesday, 19 April, Cardinal Joseph Ratzinger was elected the 265th Pontiff of the Roman Catholic Church, selecting the name Benedict XVI. He was succeeded by Pope Francis in March 2013.